The Wildlife Conservation Society job application is available on the organization’s employment website. Follow the steps in the instructions provided below to learn how to search for current openings, create an online account, and complete/submit an application. Several different career types can be applied for (including both full-time and temporary positions/appointments). About the Organization: The Wildlife Conservation Society is an American wildlife conservation organization based out of New York City (in the Bronx). The organization was founded in 1895 (originally as the New York Zoological Society). The WCS manages numerous parks throughout New York City (e.g. the Bronx Zoo) and has hundreds of employees (with a large majority being researchers/scientists). Step 1 – Press this link to open the WCS employment site in a new browser window/tab. 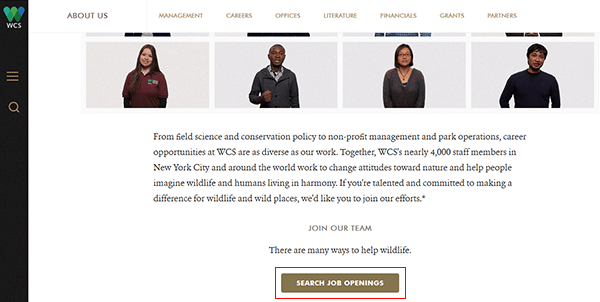 Step 2 – Scroll down the page and click the “Search Job Openings” link. Step 3 – Search the list of current openings by selecting a location or job type from the list of options. Enter a job title or keyword into the input fields and then press the “Search” button to load the results. Step 4 – The results can be sorted by job title, location, job type, department, or date updated. Click the link/title of the career that you want to start the online application process for. Step 5 – Read the job description and then press the button as outlined below. Step 7 – Press the “Create” button to register your account. After your account has been registered you will be able to fill out and submit the online application form. Note: Applications typically take 3-10 business days to be processed/reviewed (depending on the position that has been applied for).